On February 3, 2017, the Jordan Center for the Advanced Study of Russia at NYU welcomed Elidor Mëhilli for a colloquium based on his forthcoming book, entitled “Socialism in Motion: How Georgians and Russians Acted Albania’s Ottoman Past and Albanian Films Brought War to Mao’s China.” Rossen Djagalov, Assistant Professor of Russian and Slavic Studies at NYU, introduced Mëhilli, who teaches in the Department of History at Hunter College, City University of New York. Mëhilli began with background to his project, an exploration of Albanian filmmaking as a window into Cold-War-era collaboration and confrontation with both the Soviet Union and China across the 1960s Sino-Soviet split. While Mëhilli is not a film scholar, he said that he approaches the films contextually and interdisciplinarily, as “objects and instruments of exercising friendship and socialist internationalism in the 1950s and later in the 60s.” Mëhilli’s current project stemmed from his dissertation work that focused more broadly on ideas of Sovietization and how the Soviet Union promoted itself in the countries of the Eastern Bloc in the 1950s. Through his research, he found that “[t]here were many angles through which I could tell that story and one of them was through cultural artifacts—things like literature, music, and film,” he said. “Film was a particularly good one precisely because [Albania’s] national film industry, which had to be created from scratch, was done thanks to Soviet assistance.” To study the Albanian film industry and its interactions with its Soviet and Chinese counterparts, Mëhilli used Albanian and Soviet archives, non-state sources like newspapers, journals and other publications, and Chinese memoirs of those who grew up during the Cultural Revolution from 1966 to 1976. The speaker next showed a short clip from Sergei Yutkevich’s Velikii voin Albanii Skanderbeg (1953), a film about Albania’s 15th-century national hero, Gjergj Kastrioti, and his crusade against the Ottoman armies. Despite its predominantly Soviet cast and the fact that it was shot mostly in the Soviet Union, “[t]he Soviets explicitly present this film as a mode of collaboration” with the Albanians, Mëhilli explained. He then screened a clip from an Albanian documentary of Soviet leader Nikita Khrushchev’s 1959 visit to Albania—just one year before the relationship between the two countries soured—which portrayed a huge Albanian show of support for the Soviet Union. Overall, Mëhilli said that the story of Albanian filmmaking highlights socialism as a “mode of interaction,” with three main themes. The first is the narrative of nationalization in the late 20th century. Albania gained independence in 1912 from the Ottoman Empire, but was then occupied by Italy before World War II. After 1945, it became a communist state ruled by Enver Hoxha until his death in 1985. Through the tumult, Albania was “a country that [had] to create a national way of being in Southeast Europe,” Mëhilli said. While Albania experienced euphoria as a liberated, now communist country, its long string of dependent relationships and inferiority to other hegemons instilled a “self-awareness of lateness” among the population, Mëhilli said. “But what is socialism if not a formula for overcoming that sense of lateness? If there was one blueprint, it was the Soviet one for jumpstarting and fast-forwarding to a much later stage of progress,” he added. Secondly, Mëhilli stressed the geopolitical angle, arguing that the history of Albania is incomplete without the inclusion of other regional and global actors. In 1948, a conflict between Stalin and the former President of Yugoslavia, Josip Broz Tito, elevated Albania’s position vis-à-vis the Soviet Union: “It’s kind of a graduation of sorts from sub-satellite to direct contact with what [Albanians] call the homeland of Lenin,” Mëhilli said. But by 1960, detente between the Soviet Union and Yugoslavia, Khrushchev’s de-Stalinization process, and the Soviet attempt to strengthen its hold over Albania put an end to the rapprochement between Albania and the Soviet Union. Their animosity solidified at the 1960 Bucharest Conference of communist parties, just as Albanian-Chinese relations improved. Particularly during the years between 1967 to 1969, Mao decided that China “needed to follow the example of its Albanian comrades,” making an “effort to promote Albania as a model of socialism,” Mëhilli said. Of particular appeal to the Chinese leadership was the militant nature of the Albanian government in contrast to the Khrushchev Thaw. To Mëhilli, the story of Albanian relations with the Soviet Union and China is also distinct from “the Cold War story.” “I see the Cold War as [an] effort to create socialism as a world, [one] that is bigger than the Cold War,” he said. The Sino-Soviet split was “a cultural, emotional fault-line,” which showcased that socialism could express itself in many different forms, illuminating “how one can be socialist in a non-Soviet or in an anti-Soviet mode,” Mëhilli said. 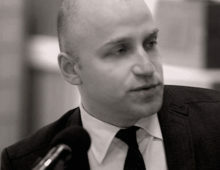 For Albania, this redefinition of socialism was “an opportunity for a very small, very insecure country to ‘go to war,’” with film, creating “these interesting windows for the Chinese to see what they think of as European cinema, and for Albanian authorities to struggle to make Chinese films popular in Albania,” Mëhilli said. But while the Albanian authorities were interested in popularizing Chinese culture, they did not want to repeat the same mistakes they had with the Soviet Union in the 1960s; they wanted “to promote Mao and China, but not to the extent that it might end up causing trouble further down the line,” Mëhilli said. Ultimately, Mëhilli said he seeks to expose a different angle of Southeast Europe in the second half of the 20th century. “You can tell the story as a story of nationalism, as that’s often done. You could tell the international history and ground it in big dates, major historical events,” he said. “But it should be possible to write this on multiple levels. My sense of socialism is one that might be told on different scales; the political is not always aligned with cultural.” The speaker also said that he hopes to restore some surprise to the narrative. For example, in his research, he found that Albanians “could see a Chinese documentary and just because there was footage of the United States in it, it became the most popular doc [in the country],” he said. Susan Smith-Peter, President of NESEEES, also wondered if Mëhilli considered looking at the idea of “socialist time or temporality” and how it played out in different places during the Cold War. At one point, in terms of the film industry, “Albania is behind the Soviet Union, but Albania is ahead of China,” she said. Mëhilli agreed that temporality serves a productive function in his research. “As much as a modernizing thing [film] is in the 1960s, there’s always a component that [Albania] is a backward country,” he said. “But there’s a weird reversal in the 1960s, where now [Albania is] a vanguard, ideologically.” Albeit brief, Albania was for a short while held up by China as a model for socialism.